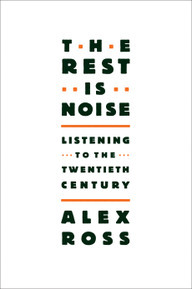 If you're a fan of modern classical music, then you probably already know all about Alex Ross, the music critic for The New Yorker magazine, his TypePad blog, and his just-published book The Rest is Noise: Listening to the Twentieth Century. If you're not (yet) a fan, Ross' writing is a great place to learn about the connection between West Side Story and Schoenberg's 12 tones, or the path from Jean Sibelius to John Coltrane. I often ask this myself. I do have a very nice day job, after all, at the New Yorker. But I find it irresistible. The blog allows me to indulge in a kind of writing that I couldn't pull off anywhere else — a little bit sly, a little bit whimsical, a little bit aphoristic, a little bit poetic, some days nothing more than a photo, other days a fragment of an essay. It's a very "now" medium, but it also somehow harks back to the nineteenth century when authors would publish bits and pieces of treatises and diaries in the columns of newspapers. After a while, with the fascinating suggestions coming in from readers, the blog more or less writes itself! Q: What music blogs are you reading lately? I'm reluctant to pick out a few music blogs for fearing of slighting others, but here goes. In my recent New Yorker piece I singled out Jeremy Denk's blog Think Denk, a compulsively readable mix of close musical analysis and personal confession. There's never been anything like it. I also regularly check in on Sid Chen's The Standing Room, which casts a very smart and sly eye on the classical world. Sid recently "outed" himself after several years of anonymous blogging: he's the artistic administrator of the Kronos Quartet. Soho the Dog is the deliriously inventive blog of the composer and critic Matthew Guerrieri. As often in the classical blogosphere, the deeply serious mixes with the deeply zany. We're all waiting the next installment of Matthew's ongoing graphic novel, "Strauss and Mahler Re-Enact Your Favorite Movie Moments." And, for fear of devastatingly sardonic reprisals, I must cite the queen of opera bloggers, La Cieca, who knows which sopranos are about to have "procedures" and which tenors are about to go bananas — and is a brilliant opera critic on the side. Many thanks to Alex, and here's to continued success with his column, his book and, of course, his blog! Write about your interest and stick to it, whether it’s economics, crafting, or stamp collecting. The more you stay on topic, the more people will regard you as a source to go to – but not if you’re a photographer who suddenly starts posting about TV shows. 3. Think of your audience. What do your readers comment on? What do they like? Find out and deliver on their expectations! Respond to comments quickly. Phone numbers, email, contact forms…they’re all good. If you want to avoid being caught by spammers via your email, spell out certain words in your email address (i.e., Bill@sixapart.com would become billatsixpartdotcom). Your audience will get to you, but spammers won't. 5. Say who you are. Many bloggers don’t have an “About” section, or if they do, it’s incomplete. Provide a brief bio about yourself and your blog, tell what you’re writing about, and why; this will help readers understand you and your purpose. Friday evening, October 26th, from 10pm PDT until midnight, (that's 05:00 am to 07:00 am UTC on October 27th), we'll be performing routine maintenance on TypePad. During this time, access to the TypePad application, TypePad blogs and the TypeKey authentication service may be impacted. Thanks for the great comments and feedback from the TypePad community this week! First Ourselves, a blog about helping women love their bodies, was featured on a KGO radio show. KGO is a news-talk format radio station based in San Francisco. The blog contains a series of inspirational posts that include such topics as how to adopt feel-good habits and letting yourself be beautiful. Also aiming to help people out is Harold Cameron, whose blog was covered by the Times-Tribune, a regional newspaper in Scranton, PA. The blog provides advice on a wide variety of subjects, from dealing with companies’ red tape to “righting another wrong.” Mr. Cameron is also promoting a Be Positive Day. TypePad customers continue to be mentioned in The New York Times.. This week, the TortsProf blog was included in an article about how much lawyers pay to find clients using Google ads . Another TypePad customer, George Mason University economics professor and editor of the popular economics blog Marginal Revolution is quoted in the article. Do-it-yourself fans in Seattle got some great resources from a Seattle Times article about various sites that offer tips and interesting home projects. Expiration Dates provides inspiration through the story of a couple who decides to build a house with the help of family and friends. And congratulations to Atlanta Boy, who tied for second place for Best Gay Blog from Southern Voice, a gay and lesbian newspaper based in Atlanta. We have more newsworthy customers in the queue for next time. Let us know if your blog has been highlighted in the media and we’ll mention it here. After TypePad tours of Boston, Toronto, and London, we head south to visit TypePad members in New Orleans and Baton Rouge. The area is still recovering from the devastation left by Hurricane Katrina more than two years ago, but TypePad bloggers carry on passionately with their lives and professions. Margaret Saizan started blogging on the eve of Hurricane Katrina and has not let up since. Her blog, Beyond Katrina , contains reports and updates about local recovery efforts, national efforts to hold politicians accountable, and coming hurricanes. Saizan is often joined by contributors Paul Greenberg, a journalism professor at Tulane University who writes extensively about New Orleans, and Matthew White, a New Orleans-based photographer, in discussing the social, economic, and environmental challenges of the recovery effort. Beyond Katrina is a powerful resource, as the number of visitors demonstrates: it has been visited by hundreds of thousands of visitors from over 190 countries. Matthew White, who collaborates with Margaret on Beyond Katrina, is building his photography portfolio on TypePad. White had been photographing remote, rural and coastal areas, historical landmarks, and nautical locations before Katrina hit, and now has a portfolio called the Louisiana Collection that includes historical landmarks lost to the hurricanes of 2005. We think you’ll agree that it’s a beautiful photography blog. Jonah P. Langenbeck writes about New Orleans, the New Orleans Saints, “the beautiful and heartbreaking urban system of post-K New Orleans.” and his job as an interactive designer in the marketing department of Cox Communications in his blog, Spastic Robot. He’s been using TypePad since 2004, so you can follow his experiences and musings through the 2004 election, to Katrina, to the post-Katrina recovery period. There’s plenty of local color and commentary in his blog as well. Up the road in Baton Rouge, the Louisiana State University Press joins the Harvard, MIT, Yale, University of California and other University Press organizations in using TypePad to promote and educate readers about their current and upcoming publications, authors and events. The LSU Press is dedicated to the publication of regional, general interest, and scholarly books, and takes great pride in being the original publisher of John Kennedy Toole’s Pulitzer Prize-winning novel A Confederacy of Dunces. Anyone at the Press can suggest an idea for a post to the blog, and the marketing department writes and posts the information. This is not a scholarly and edudite blog, but rather a glimpse at the high quality fiction, poetry and non-fiction books that emanate from the region. We'll be back next month with a tour of TypePad users somewhere else in the world. Two weeks ago, we invited TypePad members to request gift certificates to apply to DonorsChoose.org, the non-profit organization where you choose and donate to public school classrooms projects in need of funding (like a new saxophone for the music room, or a field trip to Washington D.C. to see Congress in session). The folks at Donors Choose report that the Blogger Challenge nationwide raised $130,000 during the first six days of the challenge. The funds raised so far will provide nearly 10,000 students from low-income families with books, art supplies, technology, and other much-needed educational resources. We hope that you used a gift certificate to learn how the program works, and then set up a Blogger Challenge, a way for you to ask your readers to donate to the public school projects that you want to support. The Blogger Challenge lasts through the end of the month, so there’s still time for you to set up your own challenge. Six Apart will give awards to the bloggers who reach the most students. A big thanks to those of you who are participating! As we talked about last month, we're improving the comments service on TypePad, and rolling new features out to users in phases. In September we introduced comment pagination, one of our most highly requested features, and over the past several weeks we've been rolling that feature to more and more TypePad users. Yesterday we introduced another highly-requested feature to the comment service on TypePad, the ability to automatically close comments on older posts. Many authors find that closing comments on older posts helps keep readers focused on the current conversation on their blogs, and makes it easier for them to manage and moderate the conversation happening on their blogs more effectively. You can turn on this feature on a blog by blog basis; to do this go to the configure tab and click on "Feedback," where you can set your preferences for how your readers can engage with your blog. This Knowledge Base article has all the details. Yesterday we also introduced another highly requested feature: paginating your entry archives. If you're a frequent or long-time blogger on TypePad, you know that your monthly or category archives will just grow and grow and grow as you continue to post on your favorite topics. This can create challenges for your readers, who have to load a very large page in order to read your great posts on Cooking or Software or Television. TypePad will now automatically "paginate" your date archives and your category archives, and give your readers the familiar "previous" "next" links to navigate through your archives. This feature will make your archives easier to read and faster to download. And like we did with comment pagination, we're introducing a new set of preferences for your blog where you can define how many entries to show in a set (between 1 and 50), as well as the labels you want to use for the "next" and "previous" links. Don't like "next" and "previous"? Then change the labels to "Keep going" and "Go back." Or "Mooooore" and "Lesssss." Or anything you like. Learn more about configuring your blog publishing preferences in this Knowledge Base article. Over the past several weeks we've been rolling these new features to more and more customers, making sure that before we add a new group of users that we've tested and validated the system. We expect to be able to offer these features to all of our customers in the next 4-6 weeks. It's taken a bit longer than we originally anticipated, but we want to make sure we get this right. And, as we talked about last month, if you're interested in beta testing new functionality, you can let us know by filing a support ticket and asking to be placed on the list of potential beta testers. And because we love giving everyone more design options, we've added some new great looking themes to TypePad. Look for the "Camo," "Ragged," "Stripes" and "Sorbet" themes, each of which come in several color combinations, for a total of 17 new designs to pick from. TypePad customers in the news: Keep ‘em coming! Last week, we showcased several TypePad customers in the news. Some of you sent other recent stories that include TypePad customers, so we’re covering them as well as new stories this week. For example, Martha Stewart Living magazine included Going Local, a blog written by Indiana-based food writer, recipe creator, and Advanced Master Gardener Victoria Wesseler, in an issue titled ‘going green.’ The seasonal foods grown on her mini-farm in Lebanon, Indiana, called Dirtpatch, inspire the blog posts and great recipes in her TypePad blog. Adoptive Families magazine included the Chronicles of Mommyhood blog where you can get a peek at the joys and challenges of adoption through one couple's experiences in adopting Gavin. We’re looking forward to hearing about other customers in the news. Keep ‘em coming! Attention TypePad members: Blog Action Day is this Monday, October 15th. It is a day that bloggers around the world can make an impact together by blogging about the environment. The founders of Blog Action Day set the day aside to draw attention to this very important issue. Bloggers are encouraged to write as they normally would, but along the lines of the environment theme. Given the far reach of our TypePad members, we encourage you to participate in this day too. There are three ways to do so: post about the environment on October 15th, donate any earnings from that day to a charity or one listed on the Blog Action site, and/or help promote the initiative by putting a banner or post on your blog. You can find the banners here. It's a simple but inspiring call to action that can make a statement on many levels. 10,300 blogs are already signed up (and increasing every minute) and have a reach of over 8,290,000 subscribers. On October 15th, we all have a chance to participate in and see the impact of uniting our diverse voices toward one issue that affects us all. See you on Monday. Back in March, we wrote about three widgets the Amazon Associates team built for TypePad authors. Since then, they've been hard at work developing new widgets and now have a library of 16 widgets that integrate with TypePad to let you do everything from display a slideshow of your favourite books to let readers search Amazon directly from your site. The widgets work both in sidebars and entry bodies, and are all available in the TypePad Widget Gallery. Here, we've used the slideshow widget to feature some of our favourite books from TypePad bloggers. Click "Get This Widget" to customize it to match your interests and the style of your blog.